1 How to delete an account Pokemon GO ? Delete-Account.net : The place to find out how to delete an Account ! Delete-Account.net is THE website which will help you to delete your accounts and profiles on every websites ! On Delete-Account.net, you will find Tutorials for you ! Every tutorials are designed to help the user to delete his account and all of his personal data. Step by step we will explain to you how to delete all of your personal informations on a website. How to delete an account Pokemon GO ? How to remove a Pokémon GO profile ? How close an account Pokemon GO ? How remove Pokemon GO ? Delete-account.net propose you a detailed tutorial to explain you how to delete an account on Pokemon Go. Pokemon GO is a free mobile app in augmented reality that allows users catch Pokemons at the same time they are traveling or simply walking. You can discover and catch Pokemon every where you are walking . Available on iOS and Android , the Pokemon GO app has millions of users worldwide . In addition, Pokemon GO app has many bugs. Many players complain of problems encountered during a party : excessive consumption of battery , very few Pokemon, Pokestops and arenas in their places, bug when capturing a Pokemon with Pokeballs that freeze. The game is also really addictive and can be a real problem for some players. For example we have seen a lot of car accident due to Pokemon Go users who are playing while they are driving. After a while, the game begin to be quiet of boring (even for those who are really addicted). 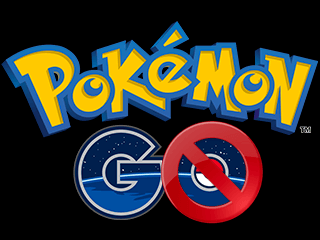 If you want to stop playing Pokemon GO, discover the solution to remove your account Pokemon GO. How to delete an account Pokemon GO ? How to delete my account Pokemon GO ? You will receive a confirmation email. Respond by writing “DELETE” to permanently close your account. Reply to this e-mail by sending “DELETE”. Please note that this way to unsubscribe only works for players registered in the Pokemon Trainer Club . Delete an account Pokemon GO and deletion of your personal data require several weeks to be processed. Deleting an account Pokemon GO is not immediate. 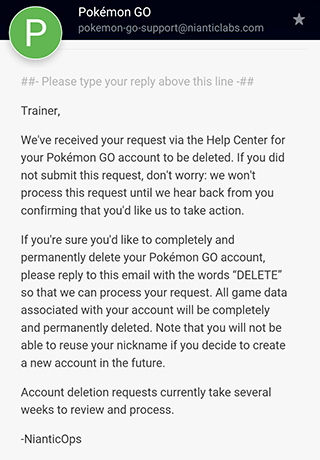 If you connected your Pokemon GO account with your Google account, there is a second method of removal . Indeed, by connecting to the mobile game Pokemon GO using your Google Account, you do not have a Pokemon Trainer Club profile . Moreover , many Pokémon GO players logging in with their Google or Gmail account were afraid because Niantic could access all the information in their Google Account. The mobile game has been updated to limit such access to personal data. To close a Pokemon GO account with a Google connection, the method is to disconnect your Google Account from Pokemon GO app . Thus, Niantic not accede to any of your personal data. You can remove the link between your Google account and your Pokemon GO account, go to this link where you will find all app associate with your google account : link to the security Google dashboard (you will have to be connected to your Google account first to access to this link). Deleting an account GO Pokemon has several consequences. Once the request to close an account sent , the action is irreversible. You can not ask Niantic restore your account, all data will be permanently erased . Your username will no longer be usable either. Once your Pokemon GO closed account , you will be impossible to play with the same account . So if you bought virtual money , virtual goods or exchange items in the shop , you can’t request a refund in Niantic after deleting your account. If you purchased Poke-coins on the shop, no returns or refunds will be made. You acknowledge that Niantic is not required to give you a refund for any reason , and you do not receive any money or other compensation for virtual money and virtual goods when unused account is closed, such termination is voluntary or involuntary. If you had follow this tutorial, you’ll be able to delete an account Pokemon GO. Delete Account is a directory of links to unsubscribe services, accounts and internet profiles. Find out how to delete your data and accounts on the internet.